Located in the heart of the White Mountains, in the midst of Waterville Valley Resort, lies The Black Bear Lodge. Situated amongst 770,000 acres of some of the most beautiful scenery anywhere, you’ll find one of the Northeast’s biggest outdoor playgrounds. 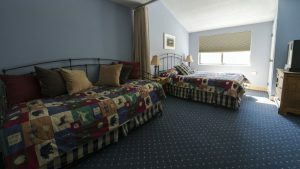 The Black Bear Lodge is an all-suite hotel with 107 individually owned units which comfortably sleep four to eight people. Our staff is dedicated to providing you and your family exceptional service. We have all of the amenities you’ll find in a condominium style hotel. Since each room is individually owned, each room is unique in style and décor. All units feature a fully equipped kitchen, living room, dining room and bedroom featuring a queen or king size bed and a twin bed with a trundle bed. Most rooms also have a pull down Murphy bed or sleeper sofa in the living room as well. If you have specific needs or tastes, please do not hesitate to ask more about our rooms. The individual owners of Black Bear Lodge choose Waterville Valley as their second home to find a special place. A place where they feel relaxed and where it is easy to reconnect with friends and family. A place where it is easy to escape and sit alongside Corcoran’s Pond, find an adventure in the mountains, share a meal and a laugh with loved ones, or shred the slopes at Waterville Valley Resort. They came here to build memories and to experience whatever they were looking for. We would like to invite you to visit us and discover why so many have chosen Black Bear Lodge and Waterville Valley as their destination for building cherished memories.